Holiday details : A boat trip on Hjalmar Bjorge, an ex-Norwegian Fishery support vessel, now fitted for offshore cruising, plus these few days in Reykjavik. 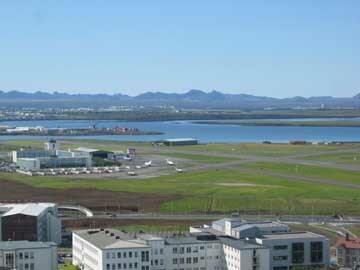 The Weather : We flew out of the cloudy north west into a sunny summer day at Reykjavik, and so it remained . . . more or less. 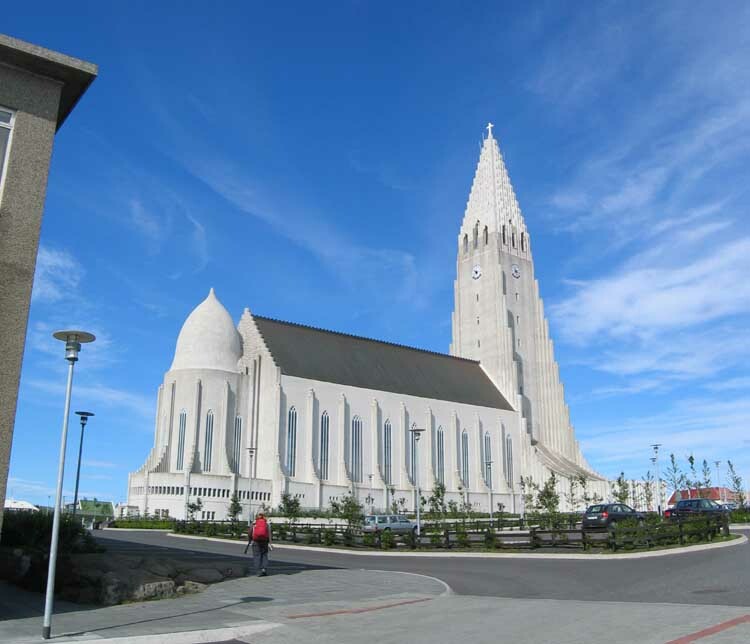 Our guesthouse was close to the town centre and a short distance from the dramatic Reykjavik Cathedral. 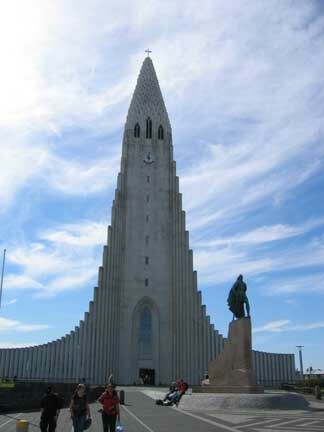 The building is relatively modern and the tower and facade were constructed to mimic the basalt lava columns that are often seen on the island. 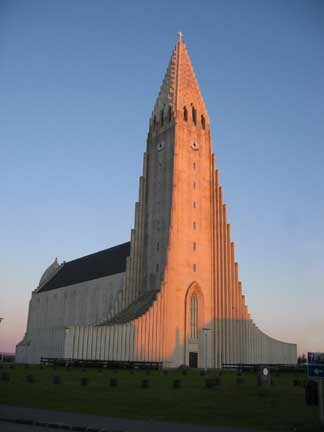 In |Icelandic it is known as the Hallgrimskirkja. 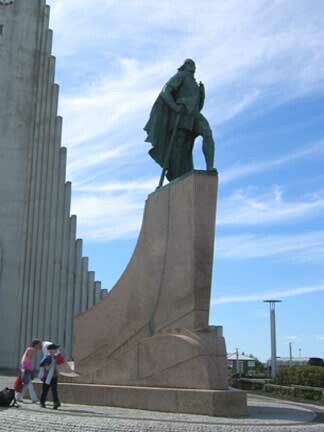 The Statue is of Leif Eriksson, Norwegian hero and famous early Icelander, who in his voyages went on to discover the continent of North America. 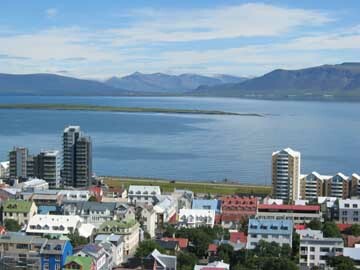 On a sunny day with such great visibility, a visit to the top of the high tower to admire the view was a must. 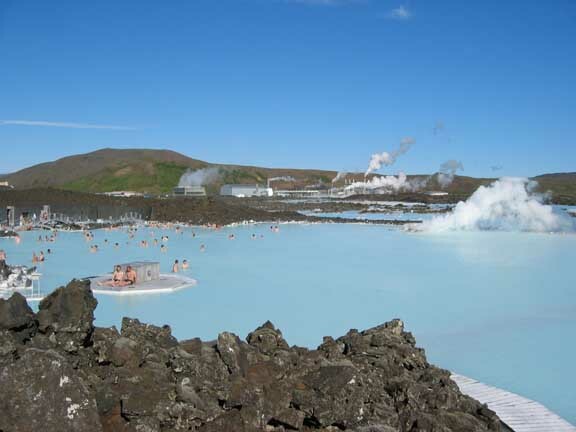 On our holiday we had planned to see Whales and Dolphins, Volcanoes and waterfalls, Icelandic ponies and the Geysirs at Geysir . .
One of the other images we were yet to experience was bathing in the hot pools, so an afternoon bus trip was planned for us. 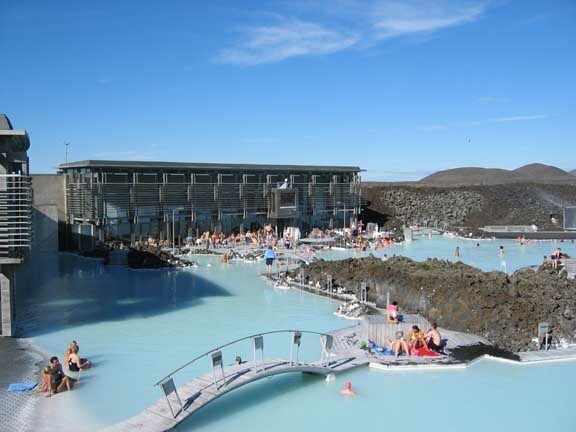 Blue water pools, naturally heated, have been turned into an outdoor swimming resort where you can go to relax, sun bathe, sauna, swim or cover yourself in the silver volcanic mud to make yourself even more beautiful ! 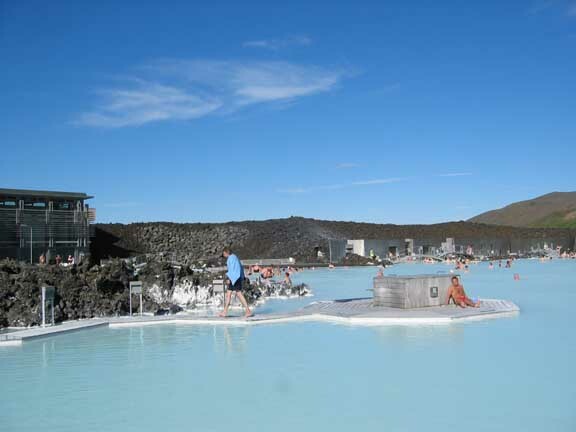 The pools utilise the hot water from the geothermal power station over the back of the complex, and the water temperature as it enters the pool is in fact too hot to approach, hence the lack of people by the steam on the right of the picture ! Back to town in the evening to capture the second of these two pictures. It was taken again late evening after we had been to the "Volcano Show" at the local cinema and a meal out in town. Next day, our last full day, involved an early start. 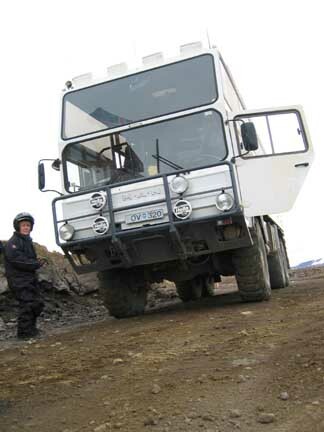 We were collected from our guesthouse by our guide in a large Mitsubishi fwd vehicle equipped with suitably impressive off-road balloon tyres. 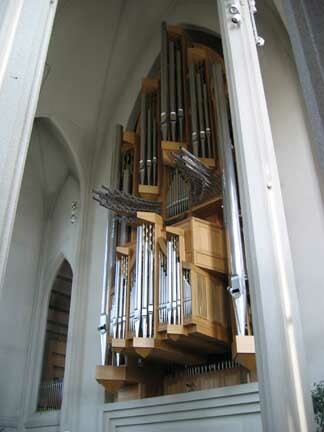 A grand Circle tour into the interior started here . 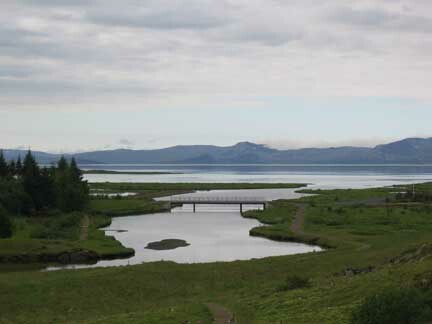 . .
Pingvellir National Park, a world heritage site, was the meeting place for the Icelandic National Assembly, the Alpingi, which gathered for two weeks every year, from AD 930 to the end of the 18th century. 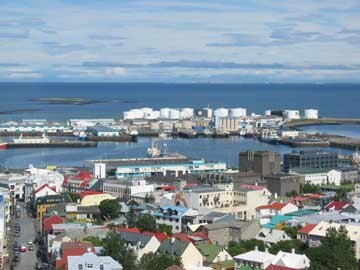 When the modern Icelandic Nation was created they gathered here again to recognise this regions importance in the past history of Iceland as a civilised nation. 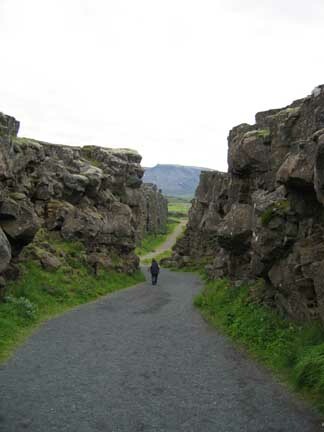 The region is also a significant geological area as it is the meeting place, or rather the separating place, of the European and North American tectonic plates and as a result the region is expanding sideways by 2 cm each year. 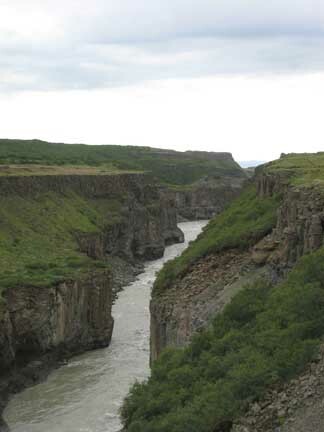 The gorge here is not water worn but is a result of the separation of these two geological land masses. 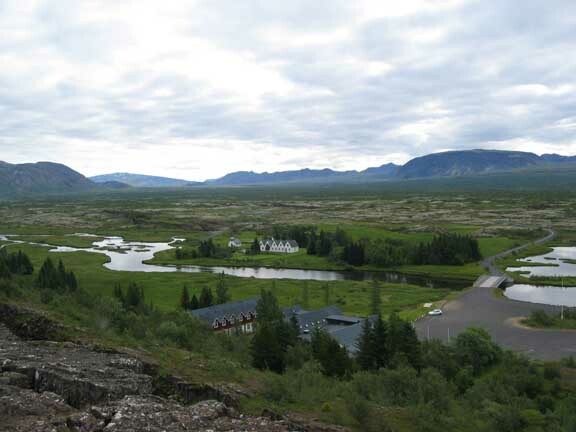 The track down from the car park took us past the basalt cliffs and down to the historic meadows and the Parliament houses below, where our guide and the car were waiting to take us on to Geysir. 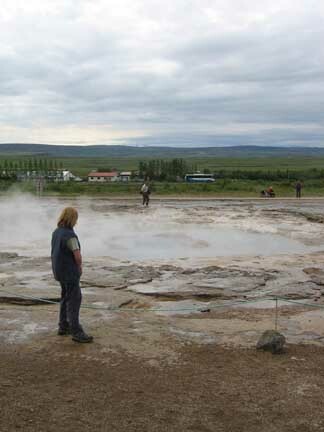 The geothermic area of Geysir village, which gave its name to hot water springs elsewhere round the world, and also to such things as hot-water geysers, the old domestic gas water heaters for homes in the 1950's. The original Geysir is no longer as active as it was in the 1930's but still has a hot pool and deep blue boiling water. 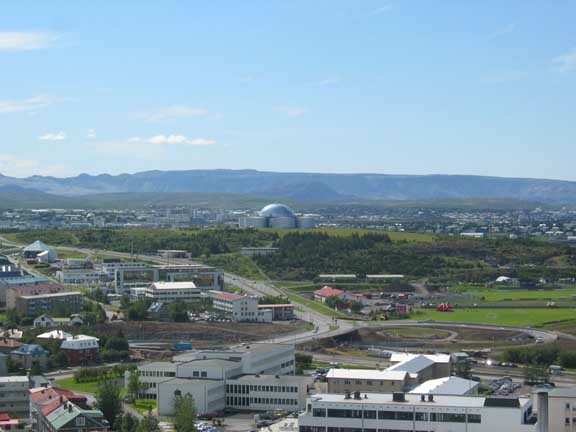 Less than a hundred yards away is the Strukkur Geysir which does however perform for us tourists on a regular ten to fifteen minute basis. 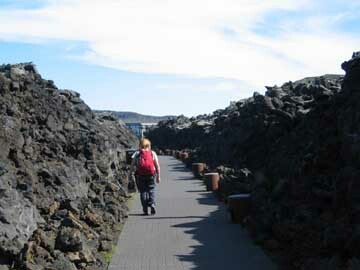 A walk over the boardwalks and barren sulphurous ground allows you to get close to these and other smaller features. The pool apparently has a deep vent full of water which progressively boils, filling the vent with steam which makes the water level rise. 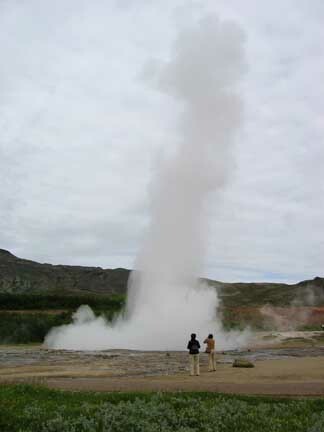 At a critical moment the steam can no longer support the weight of water, which falls back, hits the hot magma chamber below and explodes with its characteristic water and steam fountain. Impressed ?? I was !! 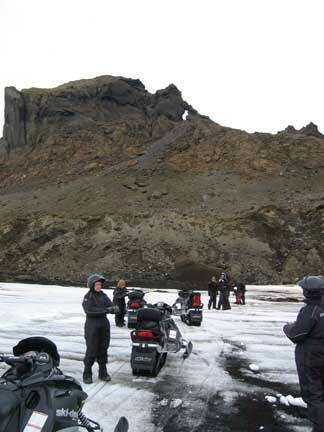 Another family portrait as our intrepid travellers kit up for a glacier ride. 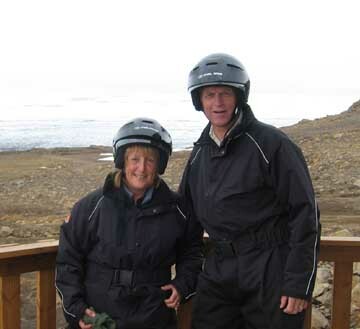 Hard hat, insulated one piece suite, gloves and overshoes, and we were off on a skidoo ride. 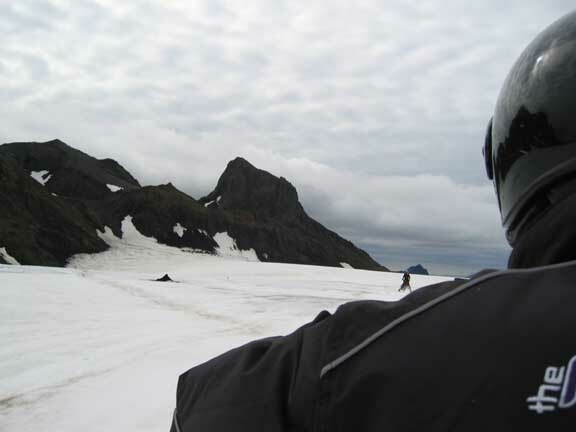 Action shot over my shoulder as we ride the glacier on Skidoo. Half way stop, we dismount to enjoy the scenery and the view. 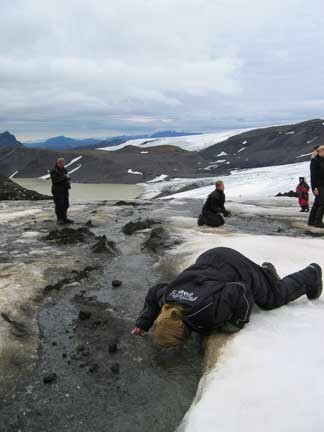 No - Ann lying down to drink the glacial water - the ultimate ice-chilled drink. Here everything is new, the start of drumlins, side and terminal moraines, glacial lakes, and steep ice eroded aretes all round. 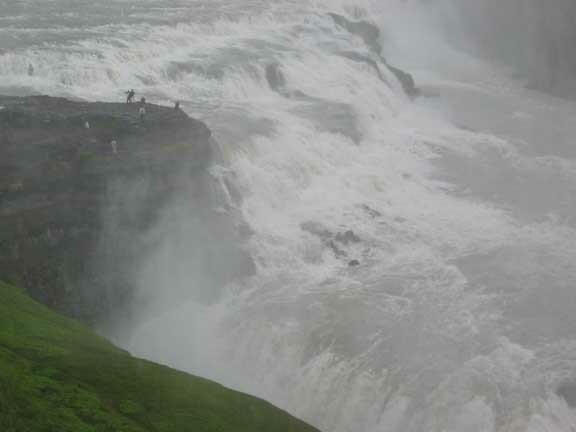 After lunch a visit to Gullfoss Falls, another of Iceland's major waterfalls. Close up - the power of the water was impressive. 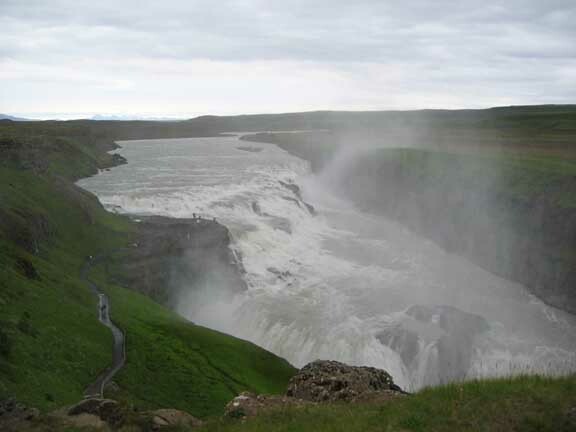 Like Dettifoss, the water was grey with alluvial silt from the glacier at its headwaters. A view of the top falls from lower down. 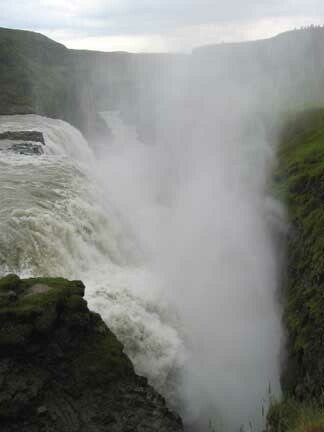 The river tumbles over the falls and then slides sideways creating a deep gorge in the process. The spray is so thick that we couldn't see the bottom - the river now hundreds of feet lower, continues on down the deepened valley. complete with a deep central lake reflecting the deep blue of the sky. 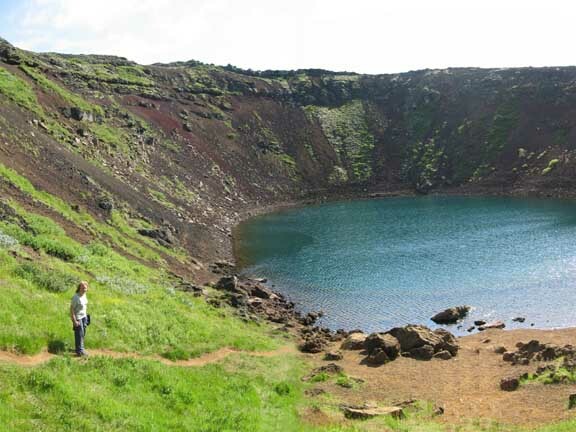 This time we were able to take the path down to the lake and get the feeling of being almost inside the mountain. Back via Geyser we were chatting to our guide about the classic Icelandic horses we had seen so he stopped off for a few moments at the stables at Geysir to see the horses there. Matching colours. 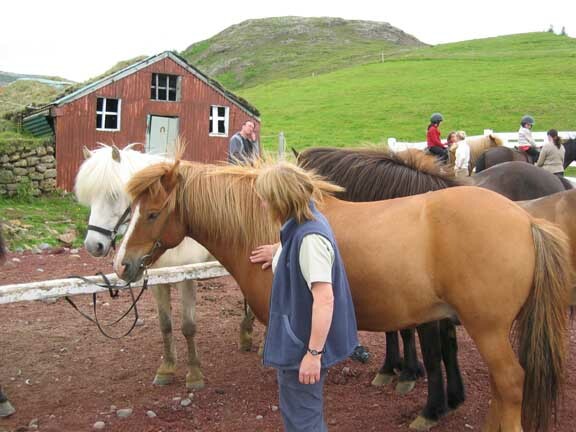 Was the horse having a good-hair-day or was it Ann having a bad one ? 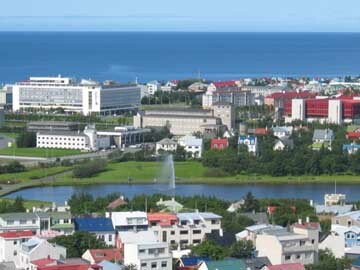 All the homes and offices in the major towns and villages in Iceland are heated by geothermal energy. Therefore each house has a separate piped hot and cold water supplies. 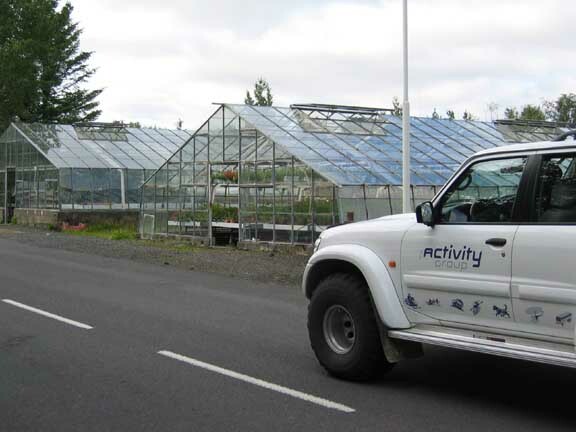 The energy is cheap enough to be used to heat the glasshouses in which they grow flowers and market garden crops. 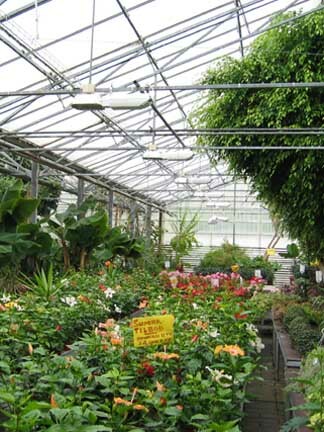 Abundant greenery in the glasshouses. They just need an additional ultra violet light source to compliment the hot water, to boost the plants during the long hours of winter darkness. Vegetables are generally imported because of the economics of farming, but they grow flowers and other crops that are of a high value nature. 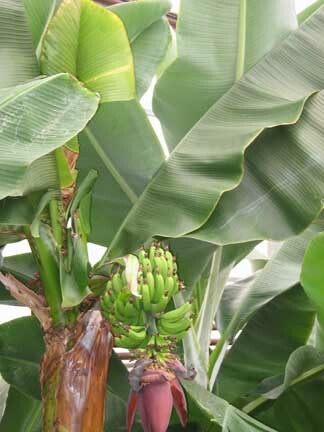 Bananas hardly a cash crop, more of a feature, in this garden centre display. Perlan Centre - once water tanks for the city's hot water, it is now a restaurant and exhibition centre. It was then back to our guest house to pack our bags for the last time. 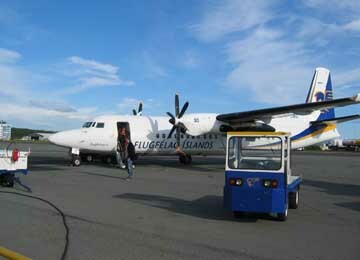 Next day the airport bus took us west out of the city, past the Perlan Centre landmark, the lava fields and the Blue Lagoon, to the international airport for the flight home. This site best viewed . . . with a contented sigh and a recently bought holiday t-shirt.